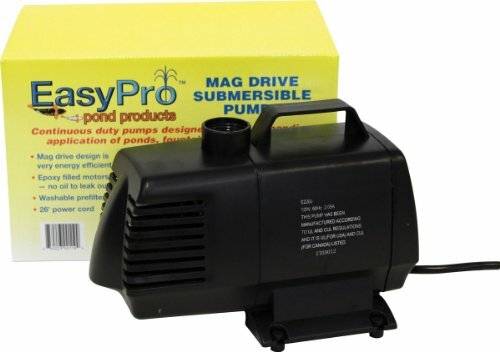 EasyPro EP2200 Submersible Mag Drive Pond Pump, Max Flow 2200 Gallons-Per-Hour | Fountain City Art Ctr. EasyPro Mag Drive pumps stand out from the crowd in features, benefits and durability, for low head applications Mag Drive pumps are unbeatable and with few moving parts, their reliability is unsurpassed, they are super quiet and very energy efficient. We offer a three year limited warranty, these mag drives are built durable, over 98 percent of these are still running after three years. EasyPro, an industry leader of quality and innovation, offers the widest selection of water feature, fountains, and lake management products available. EasyPro Pond Products is a name you can trust.